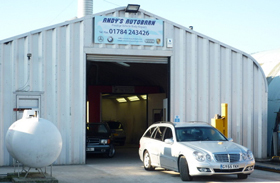 Andy's Autobarn is a leading car body shop in Ashford, Greater London. Andy's Autobarn is a bodyshop in Ashford, Middlesex which specialises in a range of prestige and everyday motor vehicle body repairs. To get your FREE quote, call us today on 01784 243426 and see what we can do for you. We specialise in expert body repairs and restorations for all types of vehicle. "Over many years I have used Andy's excellent bodywork skills to keep my 1971 Mercedes 3.5 coupe looking in pristine condition. I would definitely recommend Andy's Autobarn for a first class bodywork job." "Andy has always provided my company with a first class service and most importantly a top quality job." Colin Ferns, independent Mercedes Benz specialist. "I received a fantastic paint job on my A Class. I would recommend Andy's Autobarn to anyone who appreciates quality at a reasonable price."